Forget the iPhone 4G, this year's Apple WWDC keynote may include an unlikely guest no one would ever have predicted to show up. Microsoft CEO Steve Ballmer is rumored to join Apple CEO Steve Jobs on the stage, according to an analyst quoted by Wall Street Journal's Barron's. 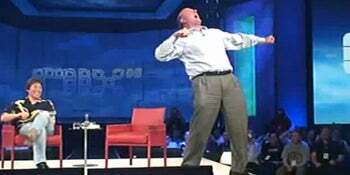 According to the Barron's report, seven minutes out of Jobs' WWDC keynote on June 7th have been blocked off for a presentation from none other than Microsoft's Steve Ballmer. This information comes from Trip Chowdhry, an analyst with Global Equities Research. The analysts contends that Ballmer will be at the keynote to talk about Microsoft's suite of development tools, Visual Studio 2010, which would allow developers to write native apps for the iPhone OS and Mac OS. The Barron's report also adds that Bob Muglia, Microsoft' server and tools head, would be the replacement in the case Ballmer won't appear at the keynote alongside Jobs. Jobs' WWDC keynote on June 7th is already a hot topic among Apple trackers. Since the iPhone 4G prototype has already leaked on several sites, the next-gen iPhone will likely be the least surprising announcement of the WWDC. A better camera and a new design are expected for the new iPhone, if the new rumor that Apple actually has another iPhone 4G model prepared to lunch this June turns out to the bogus. Another WWDC 2010 rumor includes an iPhone 4G version designed to work on Verizon's network, yet the consensus is that this is still unlikely until 2011. To top the rumours, there are also reports that Apple might briefly demo Mac OSX 10.7 at the WWDC keynote on June 7th, and could also introduce extensions to its Safari Web browser, as with Mozilla's Firefox and Google's Chrome. As usual, take all these rumors with a big pinch of salt.